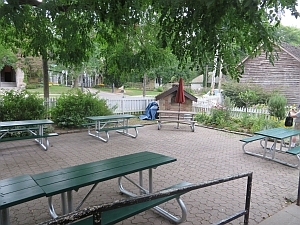 The Riverdale oven was the second one built in a Toronto park, in 2001. Elizabeth Harris got it built. 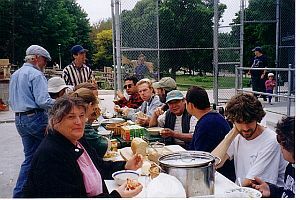 In 1999, Elizabeth managed to get a farmers' market into Riverdale Park, the first park market in Toronto. 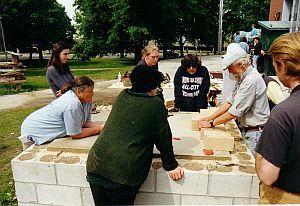 In May 2000, Dufferin Grove Park offered a hands-on seminar in oven-building with Alan Scott, lasting a weekend. Elizabeth was there, partly as a participant, partly in her more usual role as co-host of so many different events over time. In this case she helped to make sure that the builders were fed and that friendly sociability reigned. At the end of the oven-building bee, Elizabeth invited everyone to her house to celebrate. The house was well-known in Toronto for those kinds of celebrations, on the many occasions when Elizabeth steered ingenious projects to completion. 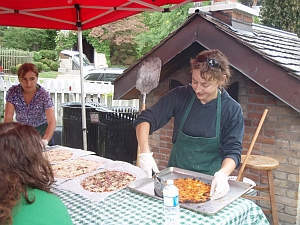 Riverdale farmers' market, the first park farmers' market in Toronto, and for which Elizabeth Harris had the oven built in 2001, has shut down. 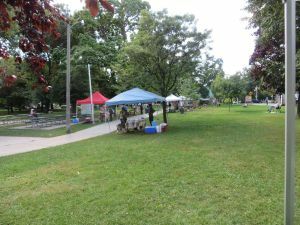 The Cabbagetown Farmers' Market has opened instead, now located at the south side of the park. 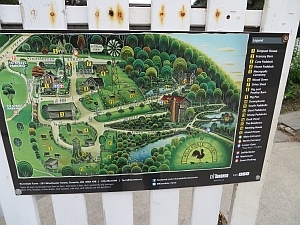 The Riverdale Farm website makes no mention of a bake oven, nor is it pictured on the posted Riverdale farm map. Nor were there any information signs when I went to look on August 26 (and at 4 pm there were no staff to ask). But it's still there. I wrote to the farm supervisor, Carol Guy, to ask if the oven is still being used. She never responded. A warm, sunny market day. The oven was locked and there was no one nearby, but there was heat-shimmer above the chimney, so obviously the oven had had a good firing earlier. At the market area there were seven vendor tables set up, but shortly after opening time there were only four customers. The vendors were spaced widely apart and the scene was not lively. 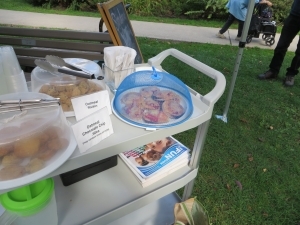 The in-charge city staff person was sitting by a trolley that had cookies, muffins, and a covered plate of mini-pizzas (made with packaged English muffins) for sale. She explained that staff had made pizzas with English muffins because the staff who makes the dough was not there that day. She said it was still worth firing the oven for the mini-pizzas because they taste better than mini-pizzas made in the farm kitchen's electric oven. Although the market had just started, the pizza-baking was done for the day -- that's why the oven was locked. The staff person said that during the summer there had been day camps using the oven, and that the camp children love English-muffin pizzas. She said that there was also a baker sometimes making bread or cookies with the kids. Riverdale farmers' market- where are the people? 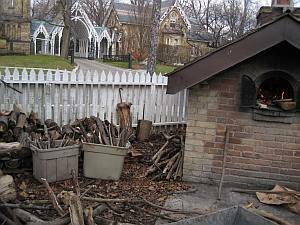 By now, the Riverdale Farm oven has become a sad example of how NOT to run a bake oven. In 2012, Sandy Straw, the Parks manager (now retired) wrote in a report that the Riverdale oven was used 31 times, including every Tuesday for the farmers' market except when it was raining (11 times) or smoggy. But the farmers from the market said they couldn't remember any use. Now the riddle is solved: the oven is run mostly when nobody can see. For example: On June 4, a wonderfully sunny market day, at 4.15 pm, the farmers' market was on but the bake-oven door was closed. However, there was shimmering heat still coming out of the chimney. 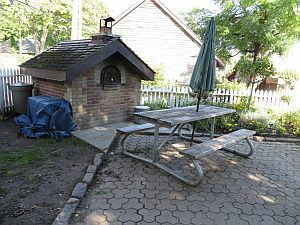 Picnic tables were placed in a tight semicircle around the oven, allowing no one to get closer than about 15 feet. Staff said they had finished making pizza (this was still more than three hours before the end of the market) and they were just letting the remaining coals burn down. One of the staff offered to let a visitor from the Dufferin Grove oven to have a look inside the oven, and he opened the oven doors to show the coals. But almost immediately another staff told the visitor to back away "you were told before to stay outside the picnic tables!" She said that there is a city policy against letting people look into the oven when it's lit. No one else at the market was coming to see the oven -- since there was plainly nothing to see. two plates of pizza: $98.40? At the market manager's table, there were two plates of pizza offered for sale. No one appeared to be buying any at that point, perhaps because the market was not busy despite the fine weather. In her 2012 bake oven report, the Parks manager wrote that there is a staff person assigned to work the oven for about 8 hours per baking, at $12.30 per hour. If the eight hours include the food preparation as well as being at the oven, then that means the cost of making two plates of pizza would have been $98.40, not counting the cost of the ingredients or the firewood. And no show-and-tell at the oven. Sad. Elizabeth died on this day. The funeral was held in one of Toronto's biggest churches, filled to standing room only. There were many affectionate recollections posted, including this one from farmer Peter Finch. Too bad that it was raining, but apparently they had never had a non-rainy day on the first market of the season in past years. It's a tradition. Farmers and vendors were relaxed and friendly despite the weather, which made the rain feel rather nourishing. I did a baking tryout here back in December. 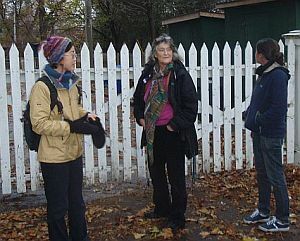 Three months later, Elizabeth Harris, the main force of Friends of Riverdale Farm, passed away. We planned another baking for the first market to honour Elizabeth who had loved the oven, but it didn't work out with the city's plan and a bit of mis-communication with the Friends. We were told that the chimney was getting fixed, so it couldn't get used until the day of the market. I went to the back of the Farm Kitchen to find a little crowd watching the baker turn the pizza in the oven. The baker told me that the city would provide wood for their twice-a-week pizza day, but the key to the oven was still not in the bakers' hands. While talking, he pulled out the pizza that looked so worth waiting for in the rain. It was cut into generous slices and the happy crowd left. The oven and the Farm Kitchen closed before 5, long before the market ended, I assumed because of the weather. My experience is minimal, but both in December and today I got an impression that the farm staff didn't like the oven. When Jutta came by to see the chimney whose crack we believed was no problem for baking, an in-charge Farm staff told her to go away. Often, the staff's goal seems to be to prevent the use of the oven, quite opposite from encouraging it. When a volunteer-based community activity is discouraged over an extended period of time, people get tired. On top of this, the Friends of Riverdale Farm have been hard hit by the loss of Elizabeth. That is another reason why we thought we would bake, since our goal is to get the oven used. It would have been nice to have some bread baked especially because St. John's bakery, the only bread vendor, didn't make it to the market today. But today, I met two bakers who clearly loved the oven. Again, friendly and enthusiastic people make everything nice. 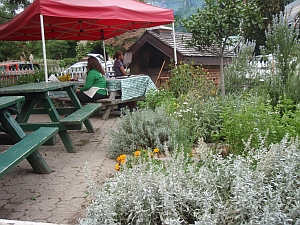 Oven, kitchen, and bakers—conditions for lively activities around the oven are there, it's just that the city has to trust the community and let nice things happen. Contrary to last week, today was perfect weather for the market. I got there before the market started and found Sarah, a volunteer baker, sitting on a picnic table by the oven with two young girls. The fire was already at the back of the oven, ready for pizza. Earlier, I had met a community development coordinator in St. Jamestown who worked with kids in the neighbourhood. She would often bring the kids to the Farm, but didn't know about the bake oven. 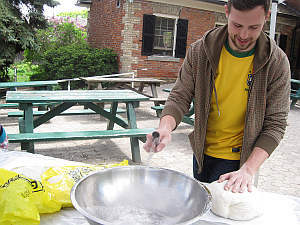 We talked about how great it would be if there was a pizza day program for the kids to have fun at.
. From talking to the current head of Friends of Riverdale Farm though, it seemed like their hands were full with twice-a-week oven operation in which they made pizza for the Farm Kitchen cafe. 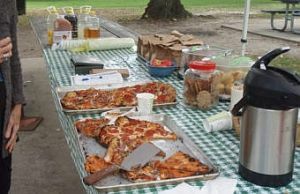 The Farm staff have had pizza days, and they could add them to their summer program. 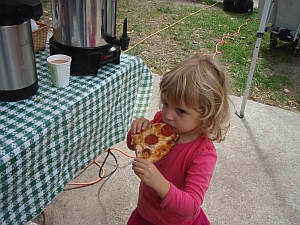 The tent was up, the picnic tables got a plastic table cloth, and pizza making started. 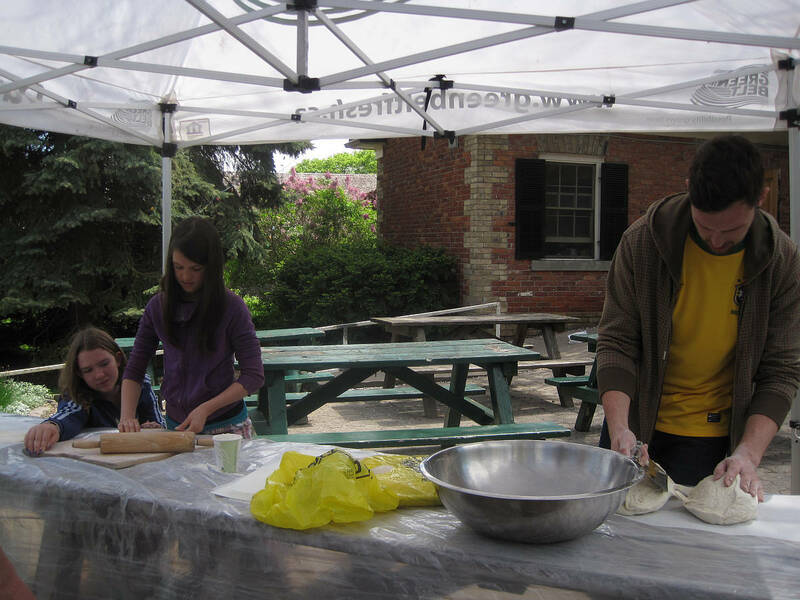 Two young volunteers rolled out the dough, instructed by Sarah who said that it made great pizza if the dough rested a while after being rolled out, before it was dressed. Next to them was a man interested in the oven, forming french bread dough he had made. They will be baked after the pizza, which made me happy just by the idea, even though I had to leave before that. But he is going to start working as a Farm staff as early as next week, so won't be able to volunteer around the oven anymore. How sad. If pizza days became one of the Farm programs, he could possibly work with the oven. I was curious about what they will decide about pizza days, but the Farm staff were busy with a meeting. Maybe next time I can ask. 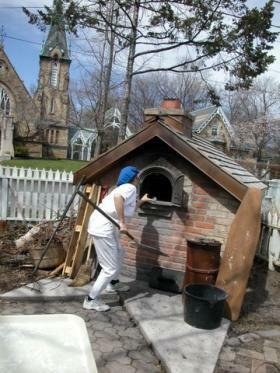 In early 2010, Elizabeth contacted other bakers around the city, saying that she was encountering more and more blocks to using the Riverdale oven. After many years of successful baking projects, bakers were suddenly told that they had to stand outside beside the oven the whole time the oven was heating up to bake (3 or four hours). Even keeping an eye out from twenty feet away in the farmhouse kitchen, which had a window facing the oven, was not acceptable. Elizabeth showing how she was locked out from the firewood area. This new rule did not appear to be based on any actual event, nor was it an initiative of the fire department. A March 2010 letter to Parks and Rec management got a response that prompted Elizabeth to point out many inaccuracies (in red) Bake Oven Questions. But her reasoning did not seem to have any standing with the City. The new rule made baking so time-consuming that oven use went way down. "The lock on the doors must be a City Lock as per policy (we will be putting a lock on the oven door today, access to the lock will be thru Farm staff)." The farm staff changed the lock on the oven so that Elizabeth and the other bakers could no longer use their own key to light the oven early. This meant that all baking was shifted to a later time, less convenient for bakers. Bakers tend to start work early -- but now they couldn't. And Riverdale farm staff followed this up by putting a new lock onto the gate that gave access to the oven's firewood supply, so that bakers would have to hunt all over the farm to find staff to open the gate so they could add more firewood when it was needed. This began to seem like a kind of bullying, and Elizabeth, who was already not in good health, said it was wearing her down badly. 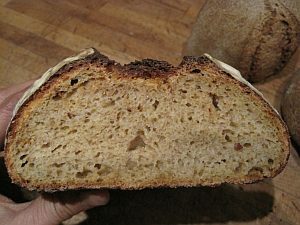 We got to the Farm just past 8 a.m. with Jeff Connell’s1 red fife sourdough and our cornmeal sourdough. 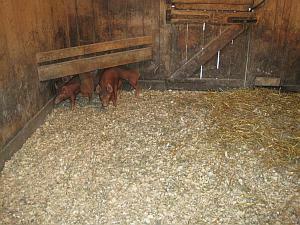 We found little piglets in a barn and the farm staff who had been looking after them since 7 a.m. We got the key, the fire was lit, Simpson House (the building with washroom and kitchen facility) opened at 9 and I set up a workspace at a corner across from Friends of Riverdale Farm snack bar. As the event opened at 10 a.m., people started coming to check out the gift shop filled with Christmas goods, to make Christmas ornaments in the front room, or to catch up with Elizabeth, a long-term friend of Riverdale Farm, by the oven. Baking is a slow activity, and even more so with a wood-fired oven in the winter. The oven took a lot longer to heat up than I had hoped, even though we fired it the day before to preheat. Those who came by in the morning only saw the fire, some dough sitting on a table, and a baker sitting on a table (literally. There was no chair) who would occasionally go out to stir the fire. For the baker, it was a day of waiting and contemplating. At Dufferin Park where we bake a lot of bread in two ovens, there is always a lot to do and time flies. Here, I just had to wait for the oven to get hot, wait for the dough to rise while trying to get the timing right. It would have been more exciting for people if we had made flat bread or pizza while the fire was on. Something to think about for next time. But I had an interesting time talking to the dough and learned that patience was key. In the meantime, more exciting activities such as decorating gingerbread cookies or hand-dipping candles were led by the Farm staff at the Meeting House, a few steps from the oven and Simpson House. One of the staff in Santa costume was strolling around, handing out Christmas candies. The outside temperature dropped in the afternoon and the day had grown greyer by the time the bread came out of the oven after 3 p.m. But it was fine, a basket full of golden loaves was bright enough. Jeff Connell arrived after baking at his own bakery to see his bread come out of this oven once again. 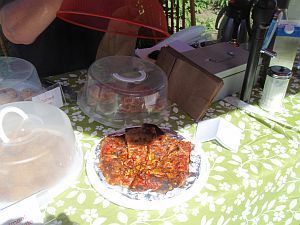 People sampled slices with Elizabeth’s homemade cranberry-goat cheese relish and the rest of the loaves were sold right away. The oven seems to be in good condition, it is a good size, and has a kitchen very close to it. It would be nice if it got used more. It would be nice if the city was more supportive of the oven getting used, by understanding what it takes to bake bread and trusting those who love baking. 1Jeff Connell baked at St. John’s Bakery for a long time, sometimes using the Riverdale Farm oven. Now he has his own bakery. On the evening of April 29, 2003, after a day of bread-baking, the bakers packed the oven with wood to dry it out for the next firing. The oven may have been too hot, the wood too dry or packed in too tight -- sometime during the night, the wood inside the oven caught fire and made the oven intensely hot. The solid antique iron door was locked and so the heat had nowhere to escape except through the concrete and the roof -- and then the shingles also caught fire. A neighbour saw the flames and called 911, and the fire department quickly put the fire out. Live and learn! The roof was rebuilt (none of the other working parts were damaged by the flames) and the bakers at Riverdale never again loaded wood into the oven overnight. There followed many baking experiments and the oven became an event attraction -- for a few years. For years before the oven was built, Elizabeth worked with others to fund-raise through the Riverdale gift shop and special events. So there was money in the kitty to build an oven. 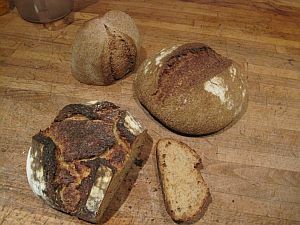 For the first two years of the farmers' market, Elizabeth persuaded the Dufferin Grove bakers to bring bread to sell at the Riverdale farmers' market, but that was clearly not a viable arrangement over the long term. 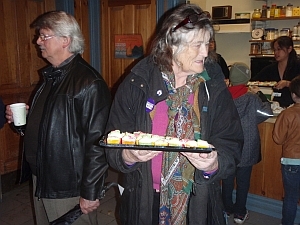 Elizabeth had close connections to many local chefs and they were also pleased about Riverdale having its own public oven -- a place where enthusiastic local bakers could try out their skills in a public forum, and learn from one another as well. There was a good spot for the oven very near the Riverdale kitchen, giving easy access to water and a convenient food prep area. 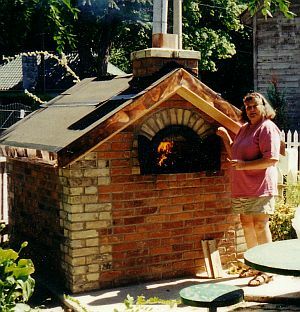 Elizabeth arranged for the City to build a simple concrete block foundation, and then got Nigel Dean to build the oven's working parts. 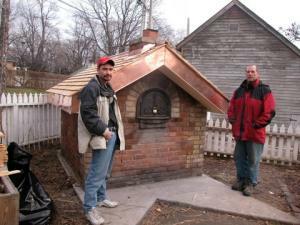 (Nigel had built the first Dufferin Grove Park oven.) A skilled bricklayer laid old brick to match the rest of the historical farm buildings, and the oven was shingled with cedar and framed with copper flashing. Elizabeth had an antique oven door stored at home, which she contributed to finish the structure. Then the learning began. Few old people remembered how to bake in a wood-fired oven. Bakers at Dufferin Grove and at Riverdale learned from books, from a few other bakers, and from trying things for themselves.